The HD Pentax-D FA* 50mm f/1.4 SDM AW heralds a new generation of Pentax Star-series lenses, the brand's premium range of optics. 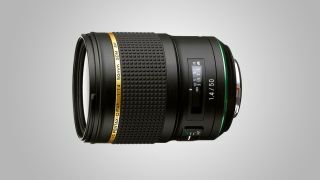 The lens is designed to deliver greatly improved resolving power, and promises to provide exceptionally high imaging performance even when used wide-open at f/1.4. Pentax claims the HD Pentax-D FA* 50mm f/1.4 SDM AW will also produce crisp, distortion-free images over the entire focusing range, from the minimum focusing distance of 40cm to infinity. The HD Pentax-D FA* 50mm f/1.4 SDM AW is an all-weather optic and features a dust-proof and weather-resistant build, with eight seals to prevent the ingress of water and dust into the lens. Mount it on a weather-resistant body like the K-1 and you'll happily be able to shoot in rain or mist, or in locations prone to water splashes or spray. There's also a SP (Super Protect) coating to keep the front surface free of dust and spots. The HD Pentax-D FA* 50mm f/1.4 SDM AW also features a newly developed ring-type SDM (Supersonic Direct-drive Motor), which generates as much as 7.5 times the torque of the conventional SDM in existing lenses. This, Pentax says, will deliver a smooth, high-speed shift of the heavy, multi-element rear lens group during focusing. As with many modern lenses, there's a electromagnetic diaphragm-control mechanism for consistent exposure control during movie recording, but this does mean the lens is only fully compatible with the K-1 Mark II, K-1, K-3 II, K-3, KP, K-70, K-S2 or K-S1. The HD Pentax-D FA* 50mm f/1.4 SDM AW will be available from July 20, priced at £1,199.99 / $1,199. Australian pricing is still to be confirmed.